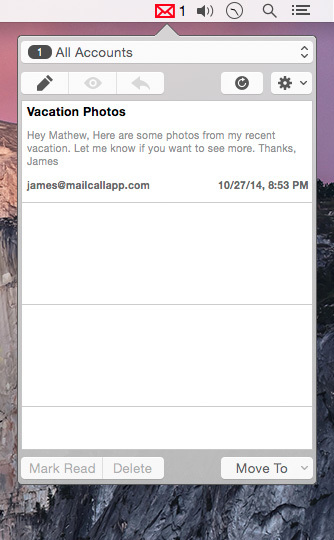 Mail Call is a full feature mail notifier for email accounts that support IMAP. Be notified when unread messages come in, and be able to quickly react to them by viewing, replying, moving, deleting, and more! Mail Call supports mail providers that use IMAP. A few examples are Gmail, Yahoo!, Outlook, iCloud, AOL, Rackspace, 1and1, and more! Upon launching, Mail Call can be opened and closed by selecting the mail icon in the menu bar. Mail Call does not currently support the POP protocol. Mail Call only presents email messages marked as unread.